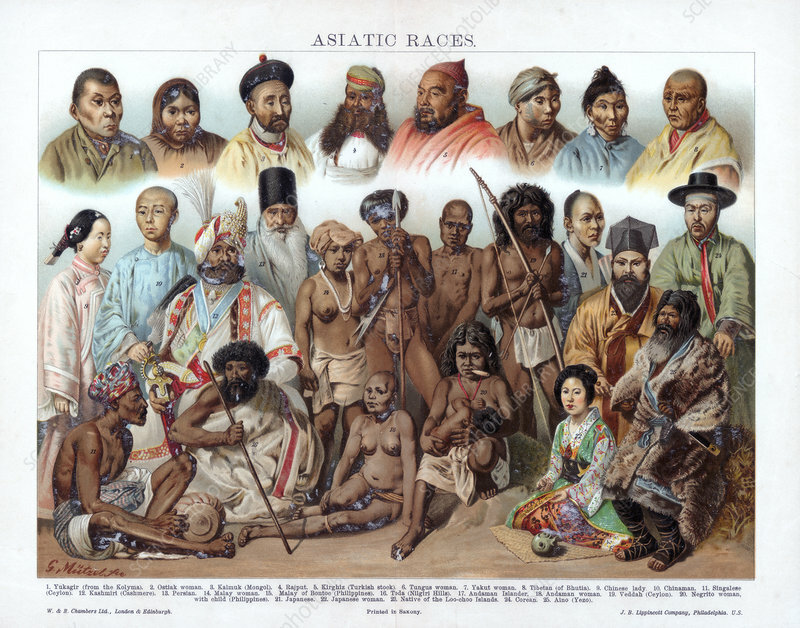 Asiatic Races', 19th century. Yukagir (from the Kolyma), Ostiak woman, Kalmuk (Mongol), Rajput, Kirghiz (Turkish stock), Tungus woman, Yakut woman, Tibetan (of Bhutia), Chinese lady, Chinaman, Singalese (Ceylon), Kashmiri (Cashmere), Persian, Malay woman, Malay of Bontoc (Philippines), Toda (Nilgiri Hills), Andaman Islander, Veddah (Ceylon), Negrito woman with child (Philippines), Japanese, Japanese woman, Native of the Loo-choo Islands, Corean, Aino (Yezo). Artist: G Mutzel.